The iPhone SE is a great choice for tracfone. Apple sells this same phone SIM-Free and unlocked for $349. So tracfone is selling the phone for $190 less than Apple. Keep in mind though that the $159 Tracfone iPhone SE is locked for use with Tracfone service, so don’t expect to buy this phone and use it with another wireless service. While the iPhone SE comes in two different storage sizes and three different colors, Tracfone is currently only has the 32GB storage model in Silver, the Space Grey, and Rose Gold colors are not available. I have found that many people don’t understand the iPhone SE. The iPhone SE is the same size and shape as the older iPhone 5S, but the iPhone SE is an updated phone that has many of the same features and specs and the iPhone 6s. The table below shows a comparison of the two phones but I’ll point out some of the differences. The iPhone SE has Apple’s A9 and M9 chipsets so the SE has much more computing power to run the latest iOS 11 and your favorite apps. The iPhone SE has 2GB of internal RAM, or memory, compared to the iPhone 5s which only has 1GB. The iPhone SE supports Bluetooth 4.2 while the iPhone 5s only supports Bluetooth 4.0. The iPhone SE is better at connecting with all the new bluetooth smart home and Internet of Things devices than than the iPhone 5s. One of the major differences between the iPhone SE and the iPhone 5s is the rear-facing iSight camera. The iPhone SE has a 12 Megapixel camera compared to the iPhone 5s’ 8MP camera. In addition to taking better photos, the iPhone SE’s camera supports 4K video (30fps) and better slow motion video at 1080p and 720p. While both the iPhone SE and iPhone 5s have touch-Id finger print sensors, the iPhone SE supports Apple Pay, Apple’s contactless payment system. I use Apple Pay all the time and I love it. Most of the stores, I shop at accept it now. 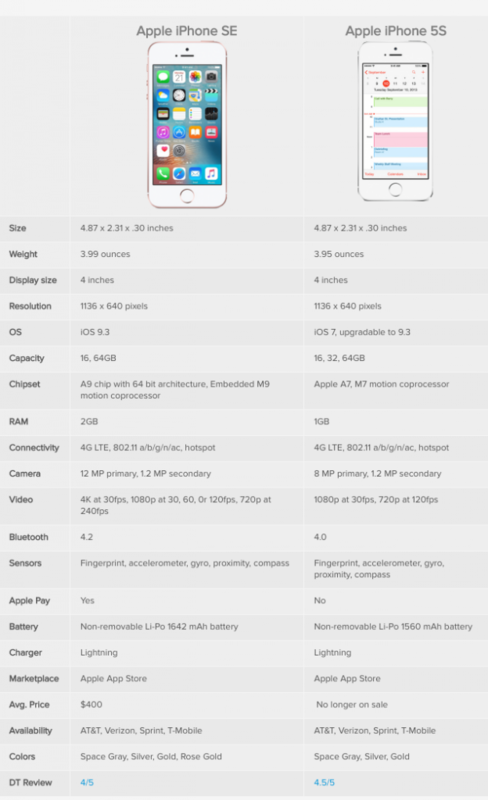 If you are interested in the iPhone SE from tracfone there are a couple things you need to know. First check with tracfone to find out whether the iPhone SE uses the AT&T, Verizon, or T-Mobile towers. 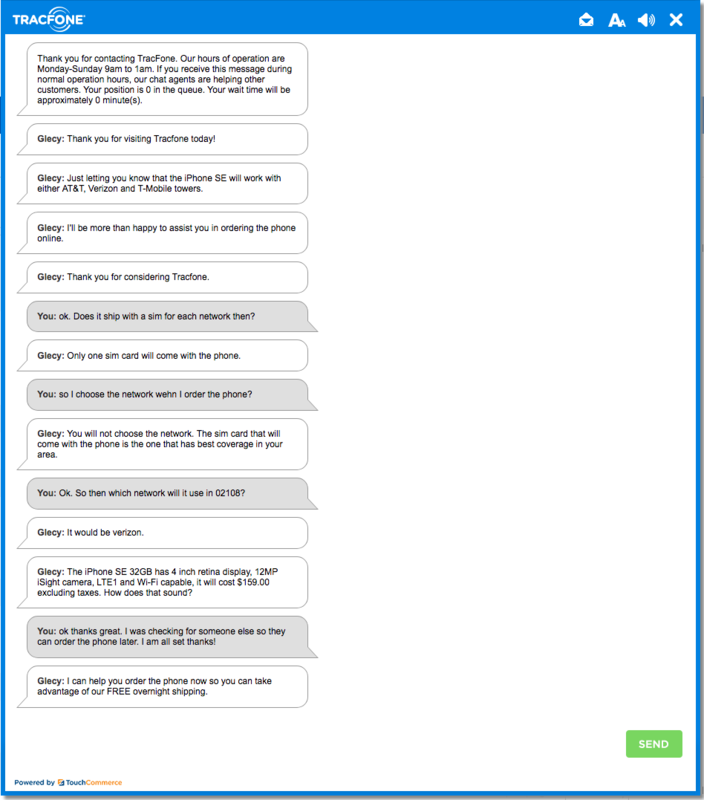 Use the Live Chat button on tracfone.com. You can see below that the iPhone SE uses the Verizon towers in my area. Next, note that when you add the phone to your cart, you’ll have the option to buy the phone with or without a service plan. If you are already a tracfone customer you’ll se able to transfer your service to the the phone. If you are a current customer, make sure you know wheter you are currently using the AT&T, Verizon, or T-Mobile towers. If you are happy with your current service, you don’t want to be suprised if you change towers with the new phone. Finally, I’d also mention that the other tracfone brands also have the iPhone SE in stock as well. So if you are looking for new service or an existing Straight Talk, Total Wireless, or Simple Mobile customer you can also get a great price on the iPhone SE as well. Be sure to check out my video below. You put together a great video. I have always been a tracfone customer. About a year ago they send me a new phone as the one I had would not work any longer. Still have a dumb phone but its newer. 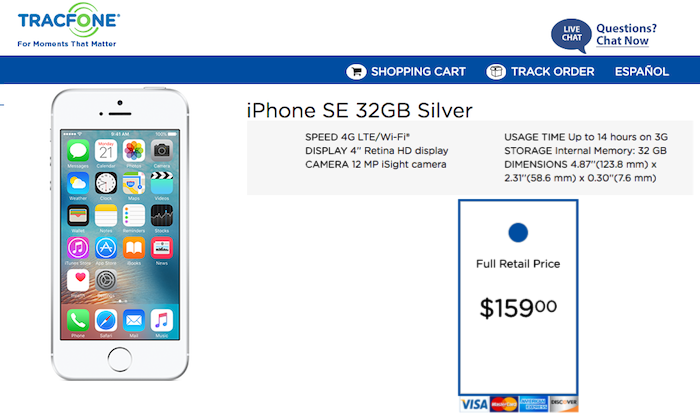 I found the ipone SE 32GB on sale for the $159.00. I’ll let hubby keep the dumb phone. No more will I hear him say “take the phone with you”. Actually I feel bad calling it a dumb phone as it truly has been a great little phone. The camera feature is the one thing that drew me to the SE as we are raising our 4 year grandson we won’t miss any more memories for him. Keep up the good work. The info you provided helped me make the finale decision. Thanks for the kind words. I am glad the video helped you out. That $159 iPhone SE for tracfone is a great deal. And you are right for the camera alone it can’t be beat. You’ll always have a camera with you now. Hope you and your family have a enjoy the holiday season with lots of great memories. I’ve tried going to Tracfone via the link and it won’t open. It shows an error message. Any idea? I’m hoping that doesn’t mean they have sold out of all of their inventory. TracFone has the phone for a much better price than Target or Best Buy. It may mean they are currently out of stock. Are you a current tracfone customer? 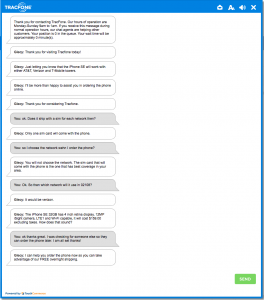 Do you know if you use tracfone’s att or verizon network? Yes, a family member is a tracfone customer. I am not certain but I believe it uses the verizon network. Yep, I really drug my feet with regards of jumping on the Smartphone bandwagon. Just the time that Apple launched the first iPhone, my financial fortunes went south, so luxuries like smartphones were put on the back burner. Interesting, though I fell in love with the iPads and of course a big Mac user going back to ’94’, my interest in smartphones were never that great, to begin with, dumbphones were good enough during those years. I’ll shoot ya an email via the SE…..
Made the purchase a few days back, the transfer of my remaining minutes and number went off without a hitch. I pondered whether it was worth it to save $30.00 and buy this phone from a Walmart or Best Buy, which were locked with other carriers or pay-as-you-go operators like Boost or Cricket forcing me to risk purchasing a phone that very likely would not work with Tracfone. At the end of the day, I realized that $30.00 would certainly not break me, so I stuck with Tracfone, glad I did.